Derry City's poor Premier Division form continued with a 4-1 defeat by Shamrock Rovers on Monday night. 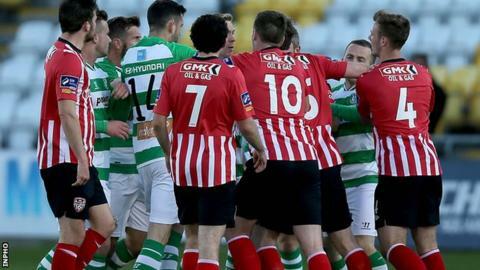 Both sides were reduced to 10 men in a fiery encounter at Tallaght Stadium, with Derry captain Ryan McBride sent off after only 13 minutes of the game. Mikey Drennan gave Rovers a 1-0 interval lead with Gary McBride, Kieran 'Marty' Waters and Brandon Miele making it 4-0 after 65 minutes. Drennan was sent off before Derry sub Ryan Curran grabbed a late consolation. The struggling Candystripes have picked up only two points from their last seven games and have won just three of 16 league fixtures. Manager Peter Hutton, whose side lost 3-0 at home to St Pat's Athletic on Friday night, will be particularly unhappy with the loss of his skipper. McBride had only just returned to action after a hamstring injury and, as this was his second dismissal of the season, he will now miss the next four games through suspension. Unbeaten Rovers struck early through Drennan's 11th minute goal and within two minutes, McBride's late tackle sparked a brawl, which resulted in a red card for the Derry skipper and bookings for two other players. Derry worked hard to restrict the home side to one goal in the opening half, but they tired, and Rovers ran riot with three goals in a 20 minute spell after half time. Ex-Leeds United and Republic of Ireland player Stephen McPhail teed up Gary McCabe for their second goal in the 49th minute. Kieran ' Marty' Waters' weak shot made it 3-0 after 55 minutes before Brandon Miele's clearly offside goal was allowed to stand. Goalscorer Drennan reacted to a tackle by Philip Lowry and was dismissed with ten minutes remaining, before Derry sub Ryan Curran scored a consolation goal for the weary visitors on 85 minutes.